C-So! 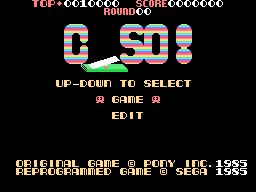 (シーソー) is a 1985 SG-1000 game developed by Compile and published by Sega. It is a port of an MSX game from the same year, which was published by Pony Canyon. The game has the player collect various items and defeat monsters by using see-saws. In order to progress, all items must be collected and all monsters must be destroyed. There is also an edit mode, allowing the player to create their own levels.